HOLLYWOOD—Having wrapped production earlier this year on the seventh and final season of the acclaimed AMC drama series “Mad Men,” Elisabeth Moss, who has played feisty secretary-turned-copywriter Peggy Olson throughout the show’s run, is moving on with her career. The final season is scheduled to air on the cable network in 2015. The first post-series project out of the gate for the 32-year-old native Angeleno is a quirky independent film called “The One I Love.” She co-stars with Mark Duplass (“The Puffy Chair,” “Jeff Who Lives at Home”) as a married couple who, at the advise of a marriage counselor (Ted Danson), go for a weekend outing to a secluded country house to try and repair their strained relationship. Once they arrive at the beautiful home, which has an inviting guesthouse, they get more than they bargained for. At the request of the filmmakers, what happens in the film will not be revealed here. Directed by Charlie McDowell, son of actor Malcolm McDowell and actress Mary Steenburgen (who does a voice cameo in the film), from a script by Justin Lader, the offbeat tale was inspired by a one-line idea by Duplass. Lader says he drew inspiration from Charlie Kaufman-penned “Eternal Sunshine of the Spotless Mind” and other hard-to-categorize films for this unique story. Moss says she was invited to take part in the 15-day shoot last year in the picturesque Southern California town of Ojai. The shooting script was 50 pages but much of the dialogue was improvised, which was a rare and fun challenge for the actress, who was used to following a very specific script on the award-winning TV series. Dressed casually in black shorts and a black and white top, the divorced actress recently spoke about wrapping up “Mad Men,” tackling “The One I Love” and what’s ahead. Q: How did this character compare to playing Peggy Olson on “Mad Men” all these years? Moss: They’re just different. I love working on “Mad Men,” and it’s probably always going to be my favorite job, but you can’t always do the same thing over and over, so it’s nice to go and have this really freestyle atmosphere, where you feel like everything you say is listened to. And something you say or an idea you have might while you’re sleeping or in the shower is something that could be in the movie. I’d imagine that’s what (Duplass) has to do when he makes his own films, but I haven’t really had that experience. So for me, it broadened my horizons in a way that I enjoyed. Q: This film starts with you and Mark jumping in a stranger’s pool, trying to relive a moment that was memorable for you. But while you two are at the country house, there’s a gorgeous pool and you never get in. Is that supposed to be symbolic of what’s going on in the relationship? Moss: (not wanting to give away anything about the story) It was a beautiful pool. There was a hot tub too. It was nice. Q: Is it more difficult as an actor to create kind of a relationship that exists so much before we meet you guys or acting that you allude to, and as you say, it’s just the house and you two? There’s nothing to distract from you guys. Q: Would you say you were spoiled by this experience? Moss: (quips) I no longer work with more than one other actor! Q: How difficult was it exploring these varying personalities and different sides of your character? Q: Your director, Charlie McDowell, said there are two kinds of actresses in Hollywood: ones that worked really hard to get there and ones that look like everybody else and just kind of landed there. Do you see that as well in yourself and in the business? Moss: That I’m like I’m the latter? (She laughs.) No, I’ve been doing this for 20-something years. At a certain point, I lost track. Once I passed 25, I was like, “Enh, **** it.” I’ve been doing this for a long time so, in a way, career-path wise and professional-wise, I feel like I’ve worked really hard and done a lot of things and had a lot of failures and I’ve paid my dues. But, I know what he’s saying. As far as like purely just acting, I’m not one of those people that goes off and does nine months of research before something. I’m not one of those people that sits in a dark room for seven hours before a sad scene, and thank God, because we did not have seven hours to do that on this one. I like to just be in the moment. I like to be in the present. Q: What did you like about your character? Moss: Gosh, it’s funny. In a way, there are parts of her that are probably the most similar to me that I’ve ever played, which you would think would be easy. You tend to hide behind characters. In a way, it’s challenging to actually have to be yourself a little bit sometimes. Then, of course, there were elements that were very different than me. She is like me, is like any girl in a relationship trying to figure out if she should stay or if she should go, whether or not (the marriage) is working. Should she fight for it or should she cut her losses and go find someone better? I think that men and women have all been there at some point, probably several times (laughing) in relationships. I really identified with that, and that’s what I think couples and people seeing this movie will identify with when they see it. Q: Was this like any other acting gig you’d had before? Moss: When I did “Get Him to the Greek,” it was so much about the punch line and getting the joke. It was so much about making people laugh. This (film) wasn’t necessarily that. Every improv we did didn’t have to land in a joke. It was about making it real. Once I settled into the fact that it just had to be real, I wasn’t nervous anymore. Q: Where do you keep your Emmy? Moss: I don’t have an Emmy but I do have a Golden Globe (She laughs.) I can tell you where I keep that. That’s currently with my mom because I moved from L.A. to New York. She’s got to ship it to me. I don’t know where she’s keeping it. But before I gave it to her (for safekeeping), it was in my bedroom in the corner. Q: Are there any perks that come with being an award-winning actress? Moss: Yeah. Basically, it’s easier to get dinner reservations! “Hi. 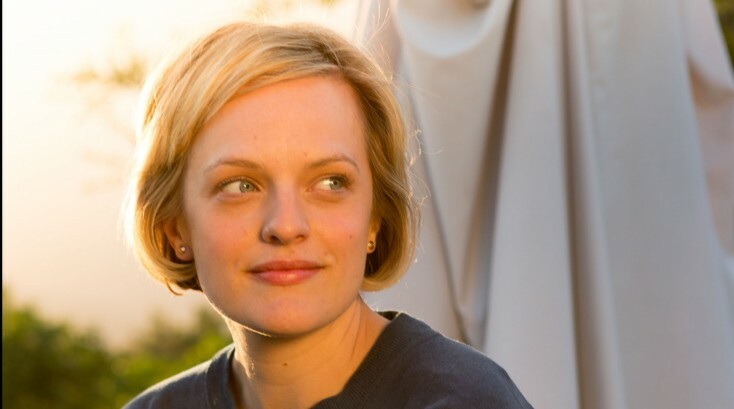 This is Golden Globe-winning actress Elisabeth Moss. I’d like a table for two.” (She laughs.) It works like a charm. Q: At the beginning of the film it stated that happiness is something we have to recreate. What was happiness for you on set? Moss: Playing (the party game) Catch Phrase with our cast and crew. It was so much fun. Then I took it to (the set of) “Mad Men,” and they became obsessed with it and we played it the entire last season. Everyone was obsessed with it. Then we moved on to (the party game) Heads Up. Moss: I’m doing a film directed by Ben Wheatley (“The ABCs of Death”) called “High-Rise.” It’s got a great cast. He’s an awesome, a brilliant U.K. director. I’m two weeks in. I go back on Saturday. We’re shooting in Ireland.